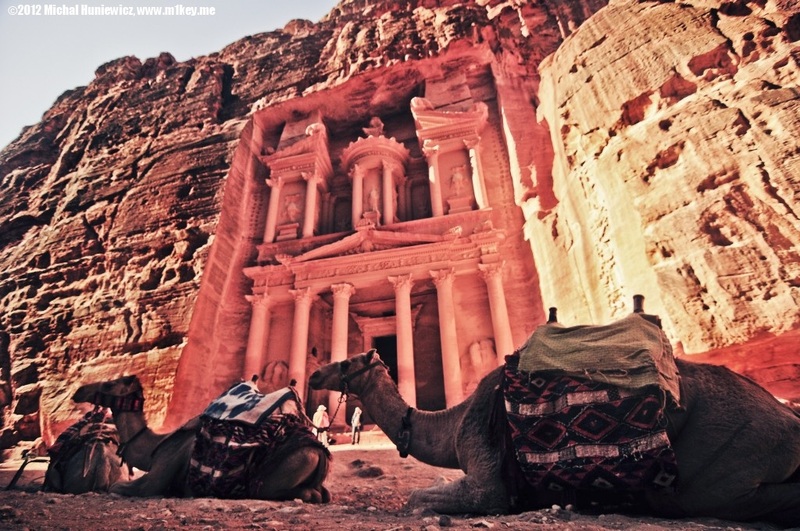 Petra is an archeological city in Jordan, the country where everyone knows Polish TV as they watch the cheesy Polsat channel with Arabic subtitles (fact). 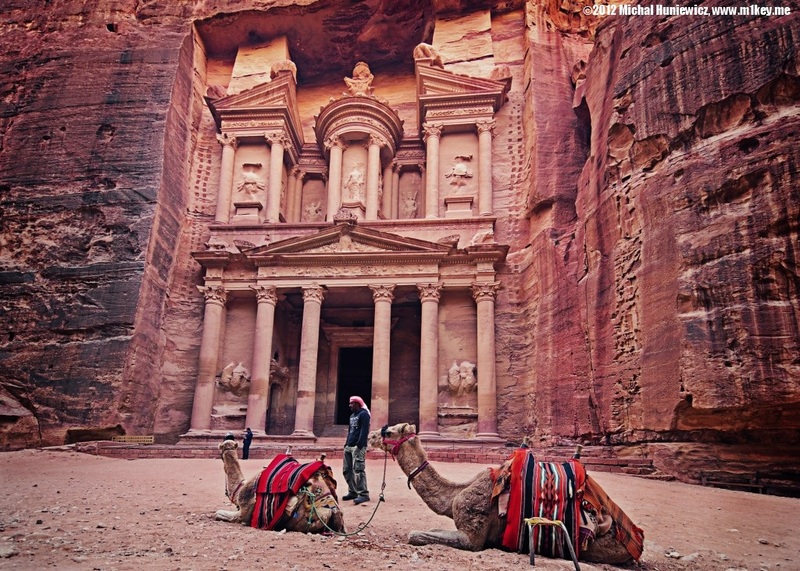 As for Petra, it was established in the 6th century BC as a capital city of the Nabataeans, the ancient peoples of Jordan. 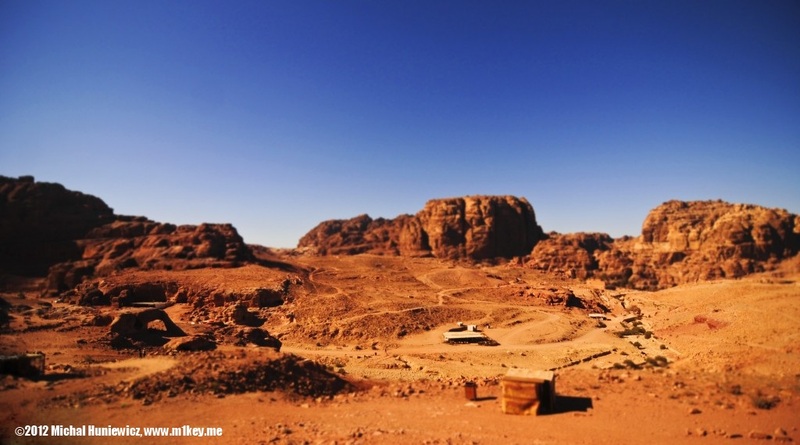 No Nabataean literature has survived (and they were presumably literate), so we don't know much about them. They were eventually conquered by the Romans. 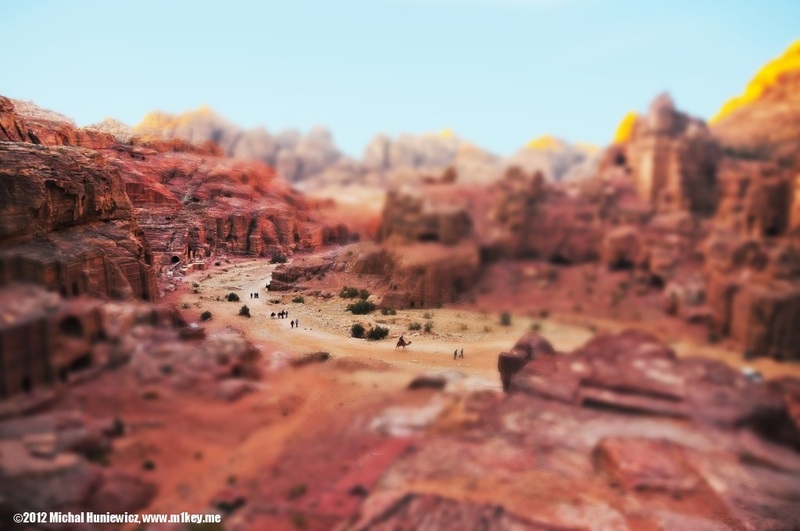 This gallery, for the first time, features some lame tilt shift pictures which are as fake as a wedding cake, but I'm still learning. 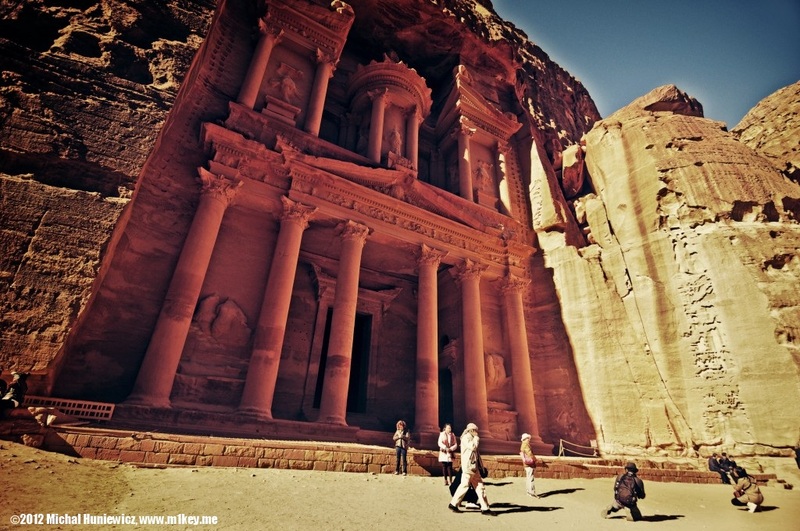 You can also check out my Petra: Part 2 gallery. 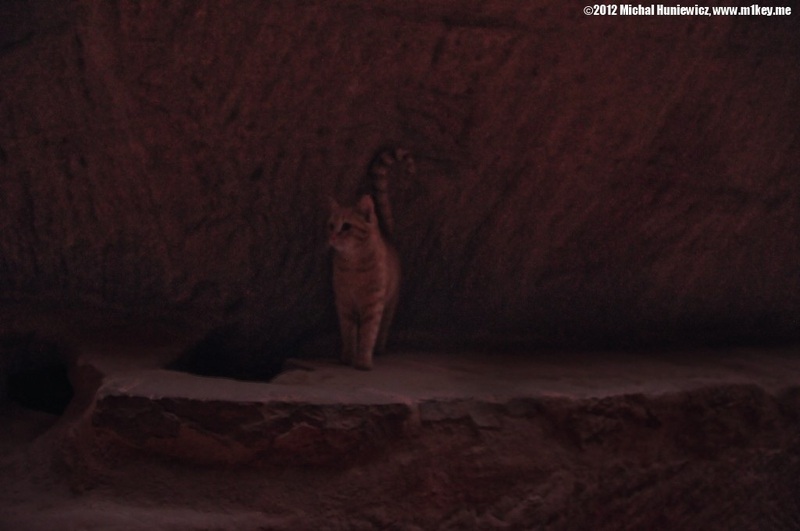 You see these before you enter the actual ancient city of Petra. This is where genies lived, according to local beliefs. Genies are spirits of the pre-Islamic Arabic folklore, and they even made it to the Quran. The Djinn Blocks like this one are probably early tombs. It was suggested that the block shape represented the ancient Nabataean god Dushara (who was the chief of the Nabataean pantheon). Al-Siq is the main entrance to Petra. 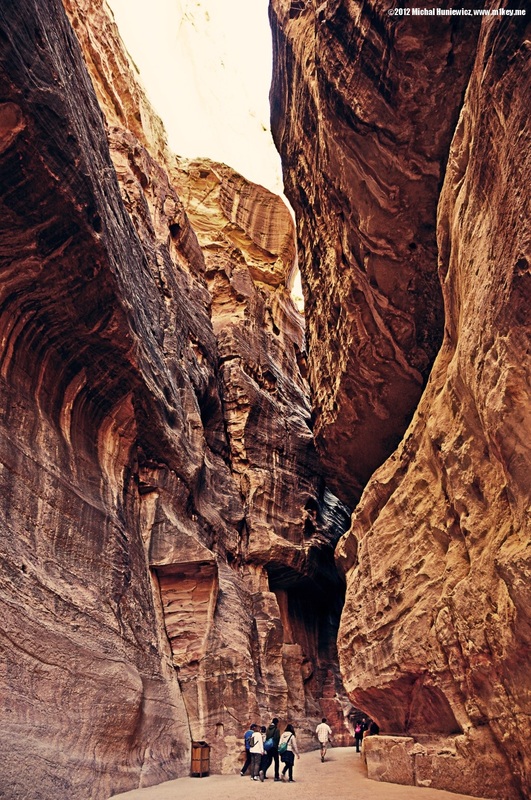 This narrow gorge is about a mile long and is a natural discontinuity of rock. 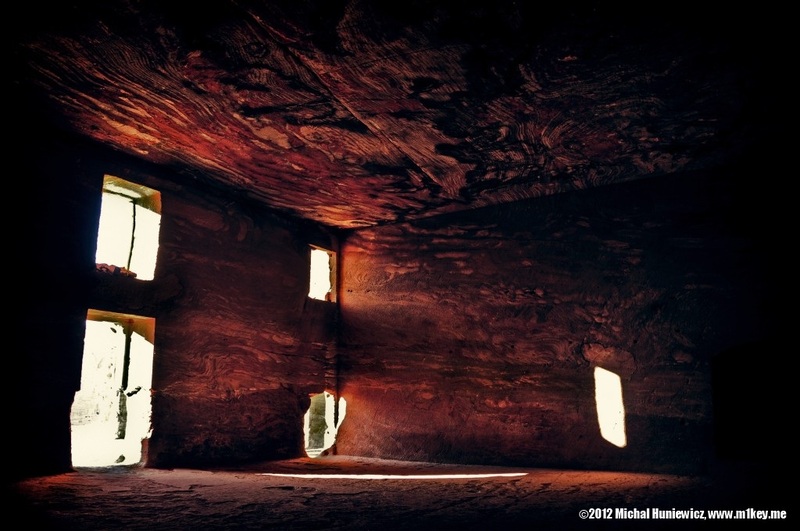 There are over- and underground chambers (you can see one on the left hand side) and the archeologists decided they were not tombs; their exact role is unknown, but most people seem to agree that they were probably guard houses. The gorge was smoothened by water erosion (here also by high ISO), just like the Antelope Canyon I showed you in my Canyons 2010 gallery. 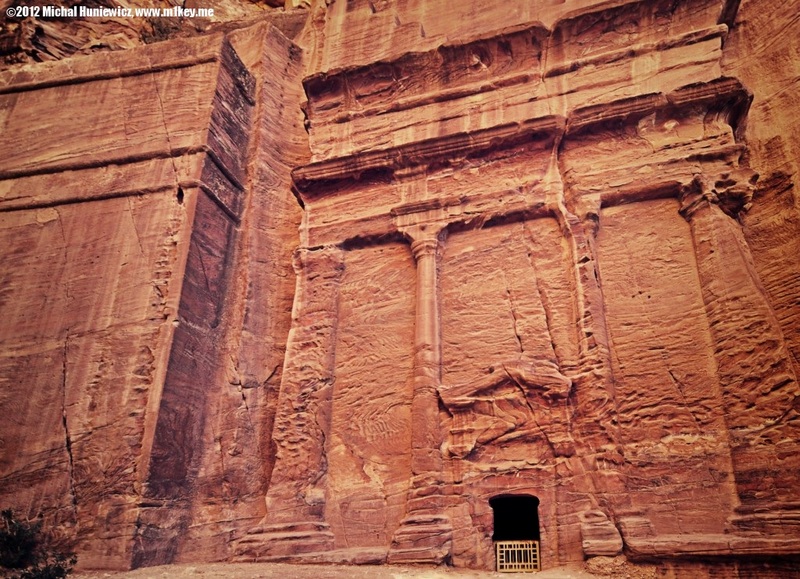 The Nabataeans built a dam at the entrance to prevent water for flowing inside, and al-Siq could then be used as the grand caravan entrance. 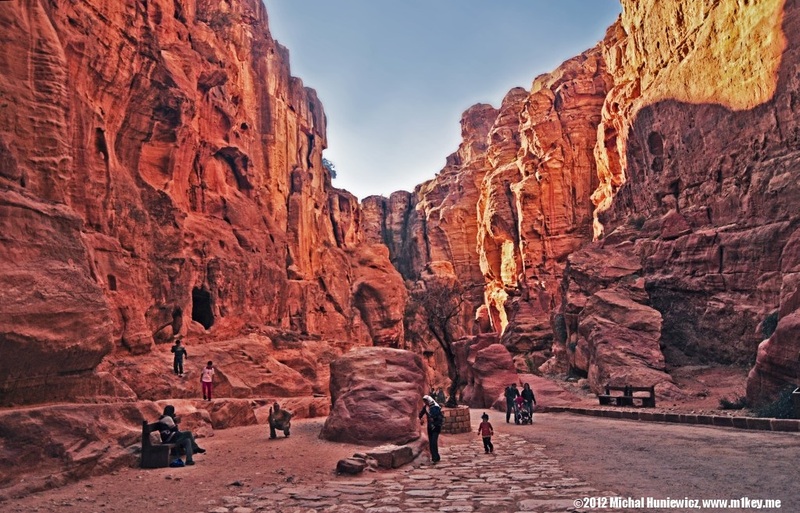 The walls of al-Siq are sometimes as much as 182 metres tall. The most elaborate ruin is Al Khazneh, the treasury. 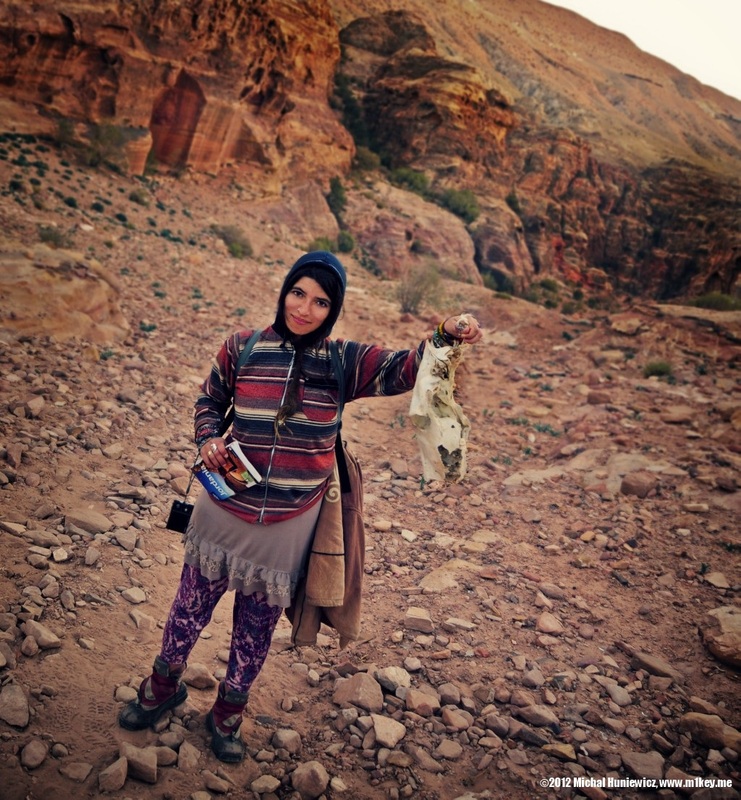 This is the first thing you see after you leave the gorge of al-Siq. 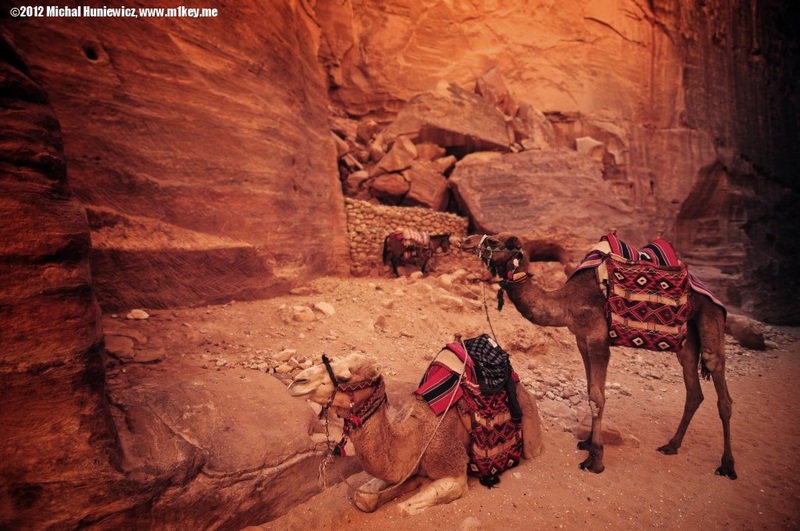 The camels await tourists who don't feel like walking to other parts of Petra (or back to the town of Wadi Musa where the hotels are; Wadi Musa means literally Valley of Moses). I bet no one has taken a picture like that before. 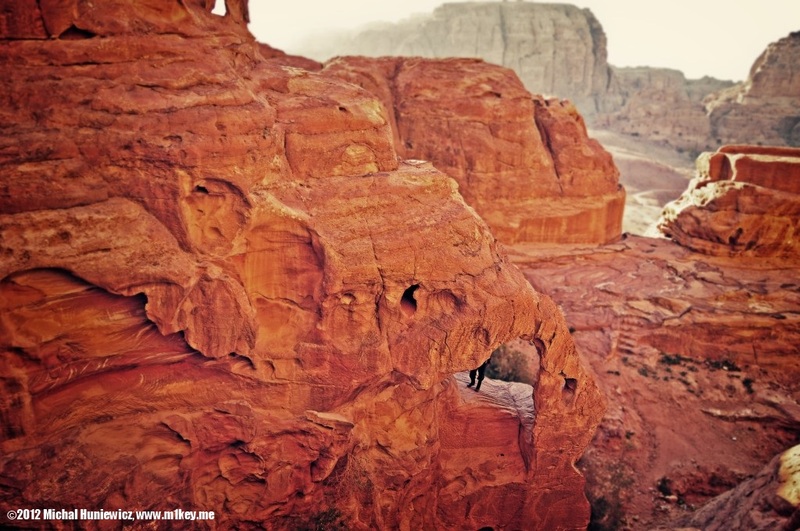 The structure of this building was carved out of a sandstone rock face. The architecture is Greek-influenced, like the tomb of Benei Hezir I showed you in my Jerusalem gallery. 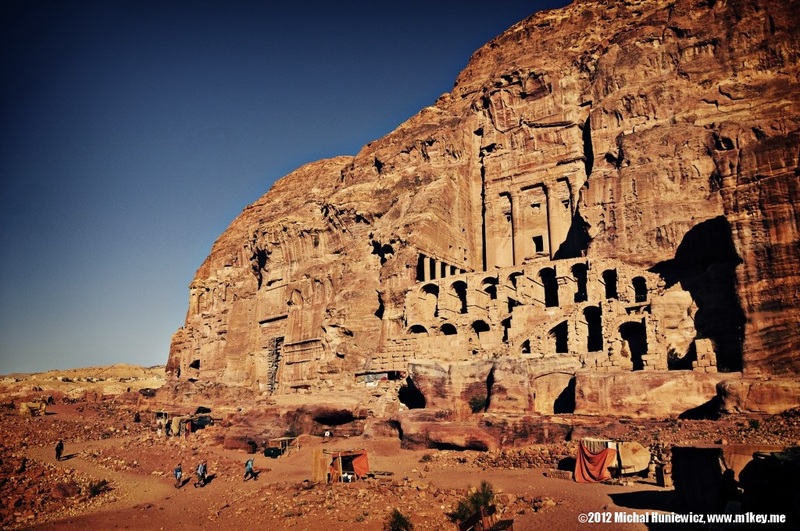 It was built between 100 BC and AD 200 and most likely wasn't really a treasury. The name comes from a legend depicting pirates or bandits hiding loot inside on the second level. 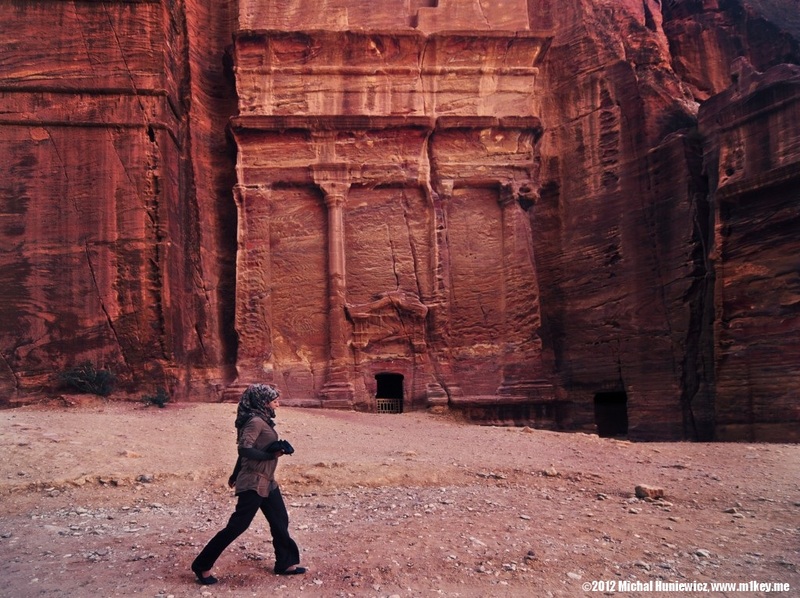 Local Bedouin tried to shoot at an urn in which the treasure was supposed to be hidden, leaving bullet marks. No behaviour from the Bedouin should surprise anyone, as I found out in the Middle East (see my Bedouin gallery). On the very top of the treasury you can see four eagles who were to carry the souls. Below, dancing Amazons with double-axes. Even lower, Castor and Polux (twin brothers from the Greek mythology) flank the entrance. The treasury was the entrance to the final resting place of the Holy Grail in the Indiana Jones and the Last Crusade film. Camels around the corner. Somehow they looked like giant spiders to me. Another example of rock-cut architecture, probably a tomb. Again, notice the Greek style. Overlooking the Street of Facades. On the left hand side, you might be able to make out the theatre. The theatre at the foot of the en-Nejr mountain. 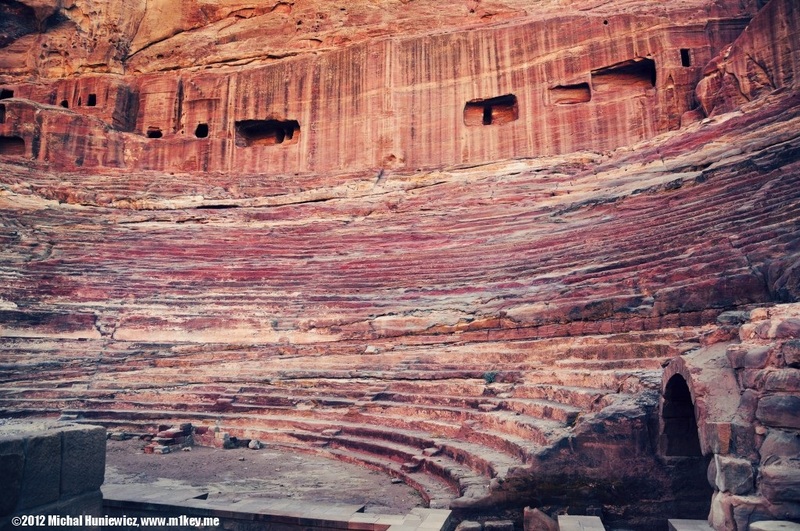 It was cut into the hillside and several tombs (visible above the seats), around the 1st century AD (therefore before the Romans entered Petra). Its capacity was 6000 people. This is the Urn Tomb, one of the so called Royal Tombs. 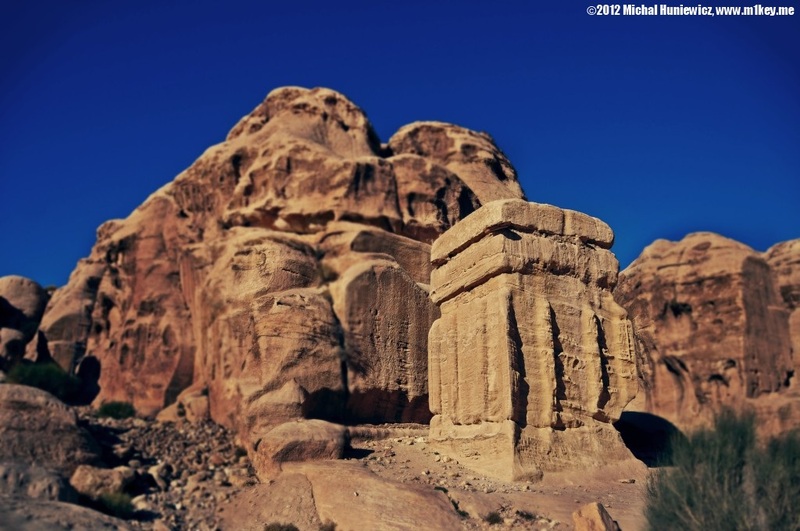 One of the Dead Sea Scrolls editors, Abbé Starcky, has suggested that this is the tomb of Nabataean King Malchus II, who died in 70 AD. The German archaeologist, Andreas Schmidt-Colinet, on the other hand has proposed that this is the tomb of Aretas IV. Inside one of the tombs. On my way to the Urn Tomb. 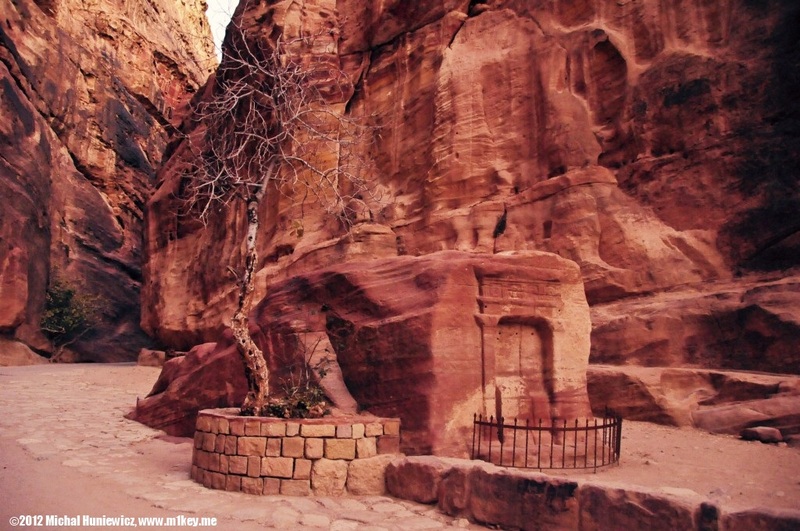 This tomb was used as a church, as Christianity made its way to Petra in the 4th century. 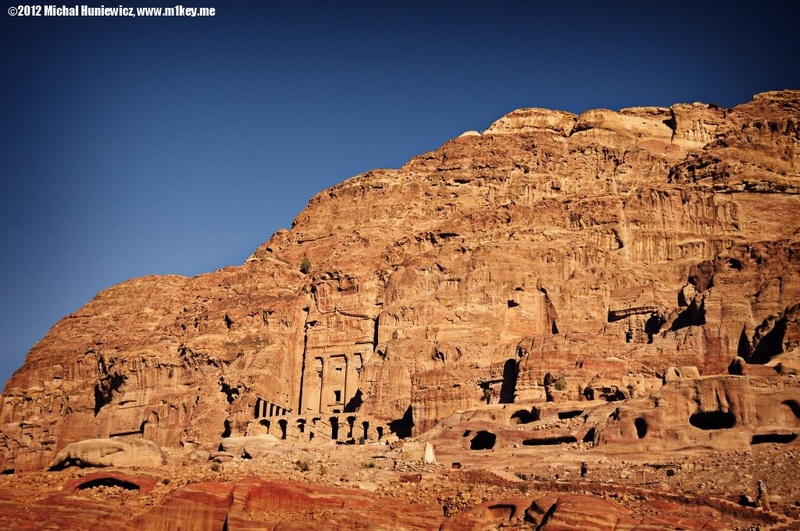 In the seventh century Christianity in Petra gave way to Islam. It was then occupied by the Christians again, during the First Crusade. The view from the Urn Tomb. A bit of the Great Temple can be seen on the right hand side. Time to leave the Urn Tomb. Also, the Silk Tomb can be seen on the left. 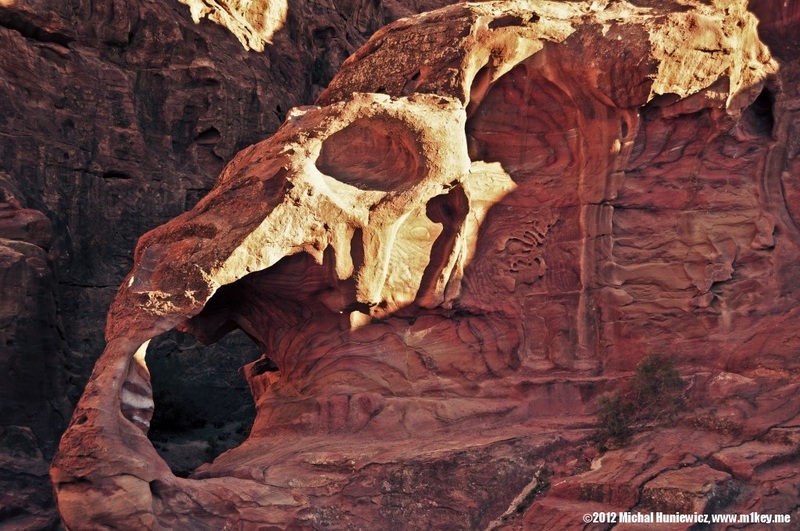 I decided to leave the beaten path and found this interesting rock structure which looked a bit like an animal skull. I noticed this man in a uniform and thought he might be following me after I had gone off track. Here, I was hiding from him and managed to take a picture of his feet. We met again later on, and I realised he was just hiking like myself. He couldn't speak English, and my Arabic isn't more sophisticated than 'ana behibak, habibi! ', which wasn't very appropriate anyway. Still, we helped each other out while climbing. Click here to view this gross image. 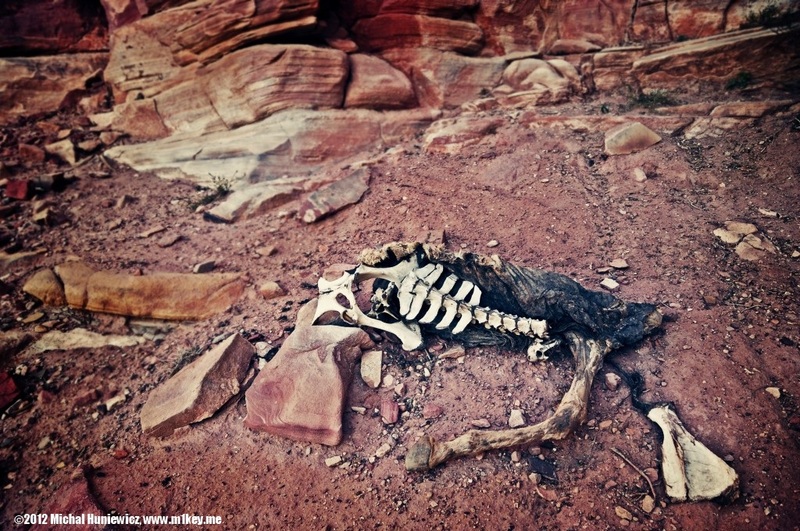 Donkey skeleton I found on my way. Being rather poorly prepared, I quickly ran out of food and water. I met two friendly Spanish women though and they gave me whatever drinks they had left, a biscuit, and offered this skull recognising me as a great traveller. 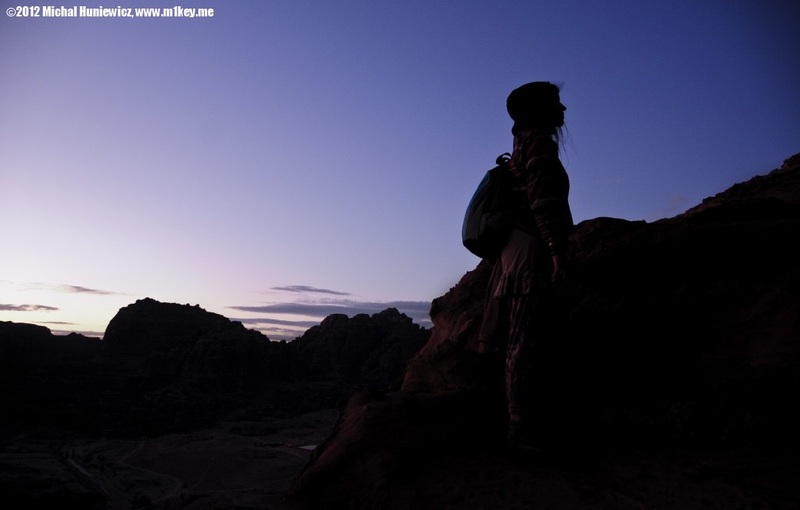 It soon became darker and we decided to head back together. 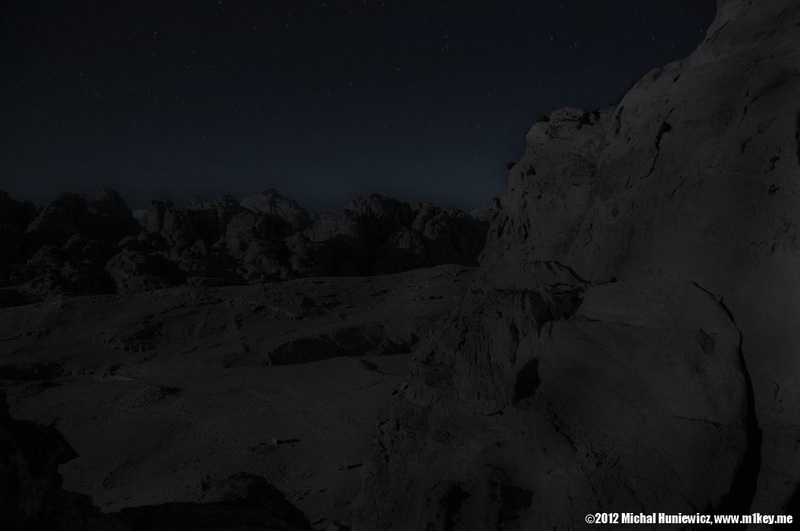 I knew a shortcut -- my original way up -- and guided them there. Here's a cat I found. I wasn't that hungry and left it alone. We had to hurry up because it got properly dark and we had no torches. 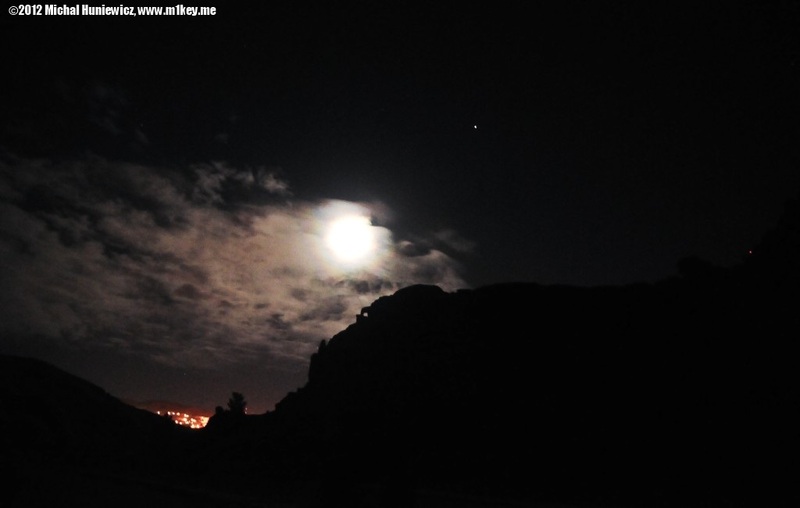 Eventually, led by the moonlight and trying not to look at genies observing us with curiosity, we left al-Siq and could see the lights of Wadi Musa. It was a long day, and my hotel staff offered me a bath with a fat old man washing my body - no thanks. 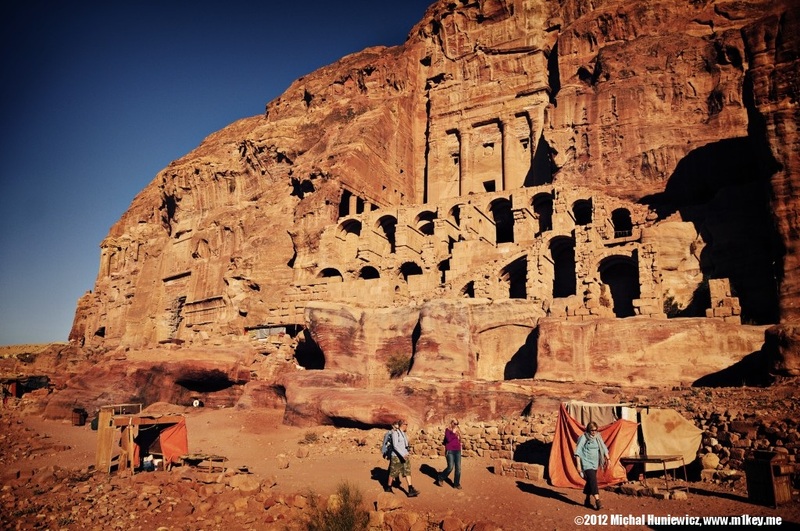 Continue to Petra: Part 2 gallery.